[SatNews] Scientists have created a new map of the world's seafloor, offering a more vivid picture of the structures that make up the deepest, least-explored parts of the ocean. 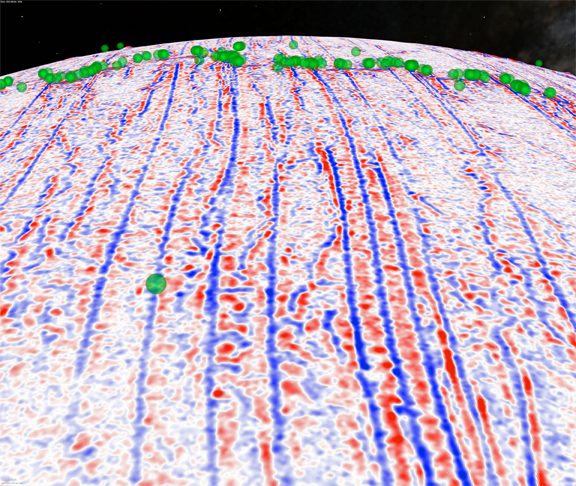 Gravity model of the North Atlantic; red dots are earthquakes. Quakes are often related to seamounts. The feat was accomplished by accessing two untapped streams of satellite data. Thousands of previously uncharted mountains rising from the seafloor, called seamounts, have emerged through the map, along with new clues about the formation of the continents. Combined with existing data and improved remote sensing instruments, the map, described today in the journal Science, gives scientists new tools to investigate ocean spreading centers and little-studied remote ocean basins. Earthquakes were also mapped. 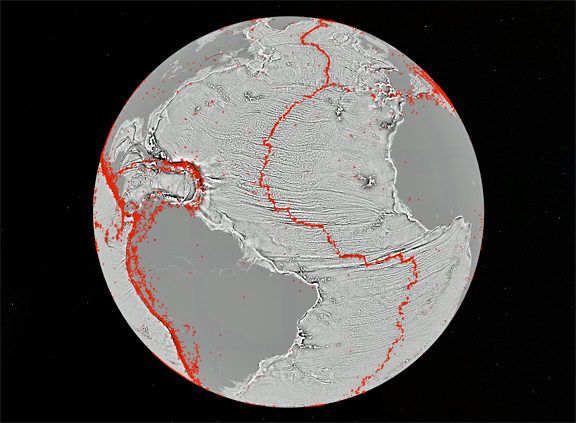 In addition, the researchers discovered that seamounts and earthquakes are often linked. Most seamounts were once active volcanoes, and so are usually found near tectonically active plate boundaries, mid-ocean ridges and subducting zones. "The team has developed and proved a powerful new tool for high-resolution exploration of regional seafloor structure and geophysical processes," said Don Rice, program director in the National Science Foundation's Division of Ocean Sciences, which funded the research. "This capability will allow us to revisit unsolved questions and to pinpoint where to focus future exploratory work." 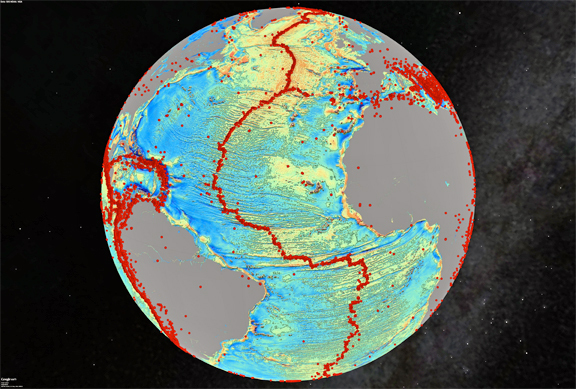 Developed using a scientific model that captures gravity measurements of the ocean seafloor, the map extracts data from the European Space Agency's (ESA) CryoSat-2 satellite. CryoSat-2 primarily captures polar ice data but also operates continuously over the oceans. Data also came from Jason-1, NASA's satellite that was redirected to map gravity fields during the last year of its 12-year mission. "The kinds of things you can see very clearly are the abyssal hills, the most common landform on the planet," said David Sandwell, lead author of the paper and a geophysicist at SIO. The paper's co-authors say that the map provides a window into the tectonics of the deep oceans. The map also provides a foundation for the upcoming new version of Google's ocean maps; it will fill large voids between shipboard depth profiles. Previously unseen features include newly exposed continental connections across South America and Africa and new evidence for seafloor spreading ridges in the Gulf of Mexico. The ridges were active 150 million years ago and are now buried by mile-thick layers of sediment. Co-authors of the paper include R. Dietmar Muller of the University of Sydney, Walter Smith of the NOAA Laboratory for Satellite Altimetry Emmanuel Garcia of SIO and Richard Francis of ESA. The study also was supported by the U.S. Office of Naval Research, the National Geospatial-Intelligence Agency and ConocoPhillips.